This festive season Comoodle has lots of ways to help you get involved with your community. For starters, there are now nearly 2000 assets on our sharing platform which groups can borrow to make their activities bigger and better. In 2017 we’ve already supported more than 250 events and activities, sharing nearly 700 separate assets in the process. We reckon that over 39,000 Kirklees residents have benefited in some way from Comoodle this year. What’s more, in 31% of cases you told us that Comoodle was either essential or very important in making the activity happen. We’re delighted that we could help and this makes us even more determined to build our sharing community in Kirklees. This wouldn’t have been possible without our fantastic Comoodlers. 50 of you have now offered your stuff, space and skills through the Comoodle platform, or offered to look after Council stuff on our behalf. Right now we have a wide range of things that need a new home in the community like machinery and electronics, sports and outdoor equipment, camping gear and inflatables. If your group could use this kit regularly, why not become a Comoodle custodian? You’ll get to keep it on a long-term basis – we only ask that you make it available to other community groups through the Comoodle platform. Don’t worry, you’ll decide how often you want to lend it out and whether you want to set any other conditions, like deposits. We’ll be holding events in the near future for groups to view the kit on offer. If you’d like to express an interest you can call us on 01484 456844, email [email protected] or connect with us on Twitter (@Comoodle) or Facebook. And that’s not all. In December we’ll be holding invitation-only events with our Comoodlers where they’ll get a sneak preview of the new, improved version of the Comoodle platform! If you’re not involved with a community group right now, we still want you to get on board. Perhaps you’re having a clear-out and want to find something a good home. No problem! In just a few seconds you can tell our 400 Comoodlers about it by posting it on our platform. We’ve relocated all kinds of things with local organisations to give them a new lease of life for a worthwhile cause. Register for free at www.comoodle.com. 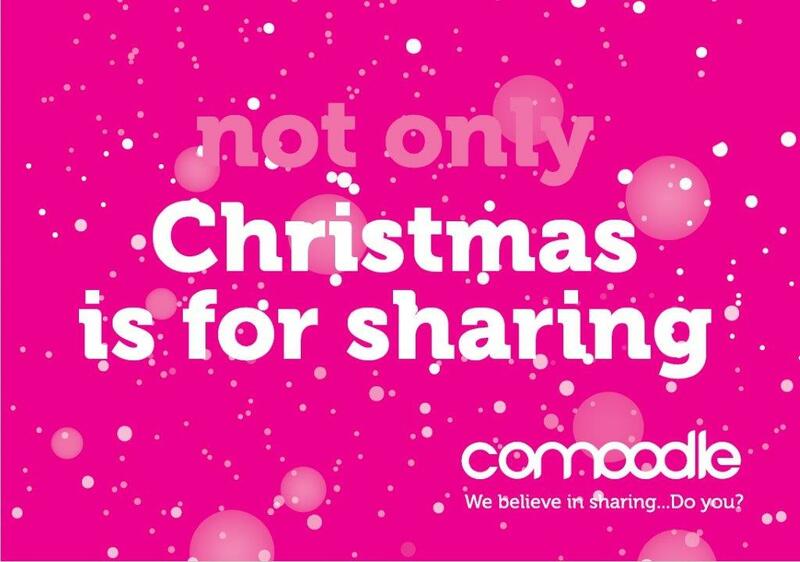 So this Christmas remember: It’s better to give than to receive, but sharing is better still!